The Hurawalhi Island Resort offers the ultimate in luxury and romance, with a huge range of facilities and amenities to keep everyone entertained. Located on its own private sand bank the hotel is surrounded by beautiful tropical gardens and crystal clear waters full of coral reefs and over 2,000 species of fish. Each of the rooms offers elegant interiors combined with a luxury beach hut feel. Choose from beach access surrounded by exotic gardens or rooms along the wooden pier with private decks and the gentle sounds of the waves beneath. Snorkel straight from your room or relax in the interiors. When it comes to mealtimes there are some fantastic options, while the many excursions will keep you active throughout the day. Enjoy breakfast, lunch and dinner at the Canneli buffet restaurant or a 3 course lunch or dinner in Kashibo restaurant (reservations required, subject to availability) as well as a 24 hour "A la carte snack menu" served all day at the Coco Bar. Drinks comprise of over 50 cocktails, including the hotel's own signature drinks, 55 premium brand spirits and liqueurs a selection of over 60 house wines, international draft beers, bottled beers and cider; soft drinks including tea, coffee, sodas and bottled still and sparkling water. A mini bar in your villa includes a selection of drinks and snacks and is replenished daily. Guests staying on All Inclusive Plus will also receive a bottle of champagne on arrival, one complimentary Sunset Dolphin Cruise, free use of kayaks, windsurfing and snorkeling equipment as well as one 30 minute snorkeling or windsurfing lesson, free yoga group sessions and complimentary use of the fitness centre, billiards grounds and football grounds as well as the tennis, beach volleyball and badminton courts. Located on the sea bed 5.8 metres below the sea, watch the fish and underwater wildlife as you enjoy a spectacular multi course tasting menu designed by expert chefs. Dine al fresco or in the open air restaurant overlooking the Indian Ocean and enjoy five star service and candlelit evenings. Chefs serve up the freshest local ingredients to combine fine dining and flavour with sustainability and health. Options include Vietnamese rice rolls, sushi, succulent steaks and more. Surrounded by the exotic hotel gardens, this buffet style restaurant offers a fantastic choice of local and international flavours. Many of the ingredients are grown on the island and an extensive menu of excellent wines is also available. The perfect place to enjoy delicate finger food, petit fours and champagne as you watch the sunset over the ocean. Special menus and drinks on the hotel’s private sandbank can be arranged for special occasions. This rustic bar is located next to the hotel’s swimming pool and overlooks the crystal clear waters of the ocean. Cocktails, aperitifs, champagne, smoothies and more are served straight to your lounger or in the comfortable seating area. Shisha and cigars are also available. The Hurawalhi Island Resort is set on its own private sandbank where you can relax on the powdery white sands as you listen to the waves lap the shore. Enjoy your own private swimming pool or spend the day relaxing on the loungers and sun terrace surrounding the hotel’s main pool. The award winning spa offers everything from couples’ massages to full body treatments including exfoliation, facials and body wraps. Take in the views of the beautiful beach and glittering ocean as you stay fit in the air conditioned gym. Enjoy a range of water sports during your stay at Hurawalhi Island Resort, including stand up paddle boarding, parasailing and jet skiing. You can also go on dolphin safaris or search for manta rays. Surrounded by coral reefs and diverse underwater wildlife, the Hurawalhi Island Resort is the ideal place for those wanting to try scuba diving or snorkelling. Set off straight from the hotel or book trips and excursions. From sailing excursions in a luxury yacht to fishing trips or private picnics on your very own private island, spend your days in the ultimate luxury. Meet the hotel’s resident marine biologist and learn about the native coral reefs and the Indian Ocean’s many species. There are over 2,000 species of fish and 200 species of coral to discover. A professional photographer will capture wonderful moments on the beach and in the crystal clear waters, with a folder or album and USB stick to take home. 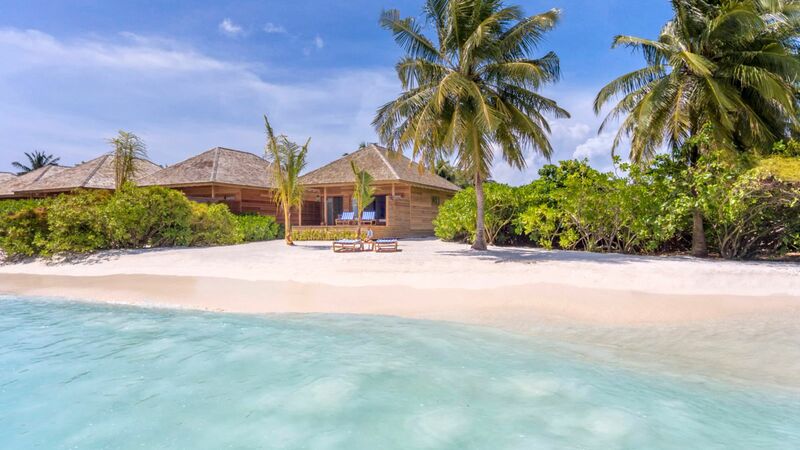 Located on its own private coral island, Hurawalhi Island Resort is surrounded by the glittering clear seas of the Indian Ocean and surrounded by its powdery white sands. Watch the sky light up in a myriad of colours as the sun sets, or spend the day on your own private sand bank. You can snorkel or scuba dive straight from your room and explore the colourful coral and see over 2,000 species of fish. Alternatively, take a day trip by boat to other scuba diving sites dotted throughout the Madives, or take a seaplane and enjoy a birds’ eye view of this stunning area of the world. Fishing, dolphin spotting and picnics on your own desert island are also available. Hurawalhi Island Resort is a 40 minute flight by seaplane from Malé International Airport. This luxurious furnished villa leads out onto a private terrace with a swimming pool overlooking the white sands of the beach and sparkling ocean. Watch the sunset from comfortable loungers or enjoy the king size bed, beautiful artworks and en suite with a rain shower, separate bath and complimentary Healing Earth amenities. Enjoy your own private deck overlooking the luscious gardens of the hotel and the sparkling Indian Ocean. Inside you’ll find a king size bed, luxury modern décor and an en suite with a separate bath and shower and complimentary Healing Earth amenities. Located along the hotel’s pier, the ocean villa has a wooden deck where you can relax as you enjoy unparalleled views of the Indian Ocean. Listen to the lapping of the waves beneath as you relax in your king size bed and make the most of the beautiful interiors and artwork. There is also an en suite bathroom with a rain shower and complimentary Healing Earth toiletries. Offering the ultimate in romance, enjoy uninterrupted views of the Indian Ocean from your private deck and fall asleep to the gentle sounds of the waves. Located along the hotel’s pier, enjoy the beautiful interiors and artwork, an outdoor bath and en suite with a rain shower, double sink and luxury amenities. 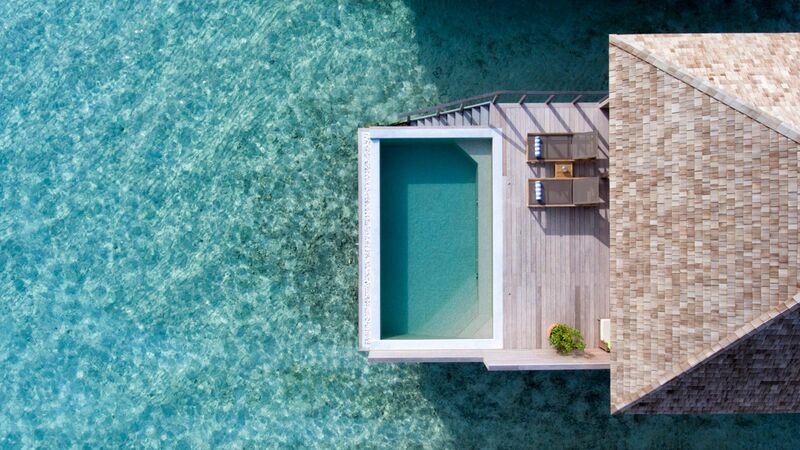 Found along Hurawalhi Island Resort’s wooden pier, the ocean pool villa has a wooden deck with a private swimming pool, ideal for a romantic holiday. Fall asleep listening to the sound of the waves, enjoy private candlelit dining and uninterrupted views of the sunset over the Indian Ocean. There is also a king size bed and an en suite with double sinks, a rain shower and complimentary amenities. When I go to Maldives (my fifth time) I usually do not like to go back to the same atoll/hotel. I made an exception with Hurawalhi as we had very good memories and impressions of our last trip there in 2018. We did not regret it in 2019. No surprises we enjoyed very much our repeater stay! We stayed on Komandoo island and got the water taxi to Hurawalhi to have lunch in the 5.8 restaurant. It was superb; the experience is great, food divine, wines spot on and staff very friendly. I'm a keen diver an loved it! From the moment they pick you up at the airport, to the moment they drop you back, the service and luxury treatment is amazing. Loved that is an adult-only hotel and you feel like is your own private island. 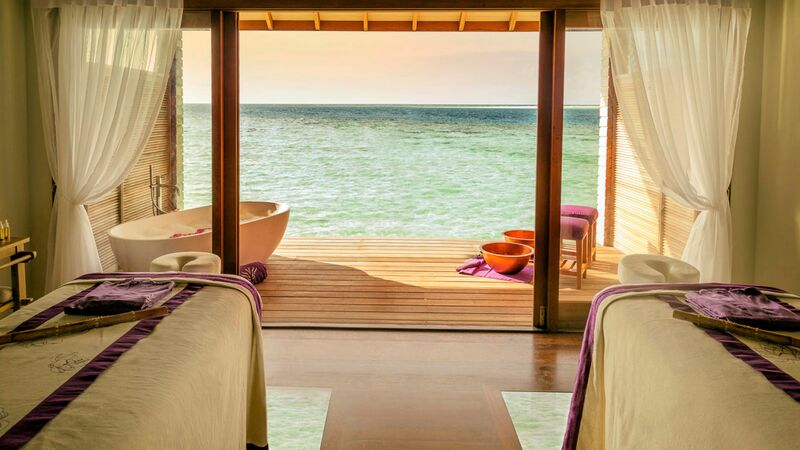 The water-villa was to die for, the views, comfort, amenities are amazing. The staff is always asking how is your stay and if you need anything. The spa is also amazing and beautiful. Food is delicious and anything you can possibly want they offer. 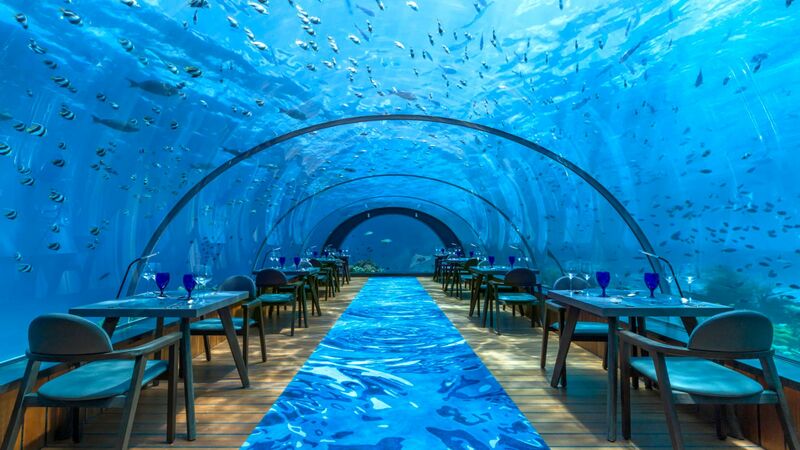 The underwater restaurant is one of the most amazing experiences I ever had, you must do it! The evenings at the bar area are super fun, cocktails are yummy and the live band is very entertaining. We have just returned from 7 nights in a Romantic Ocean Villa at Hurawalhi for our 10 year anniversary. I had high expectations after reading all the reviews and did extensive research on the best place to go in the Maldives that is 5star without being offensively overpriced. Despite these high standards, Hurawalhi surpassed even my highest expectations and is without a doubt the best holiday destination we have been to. The guests we spoke to agreed. Anif, our host, was truly exceptional in his role, making sure everything was perfect throughout our stay. Every member of staff were extremely polite, professional and attentive. 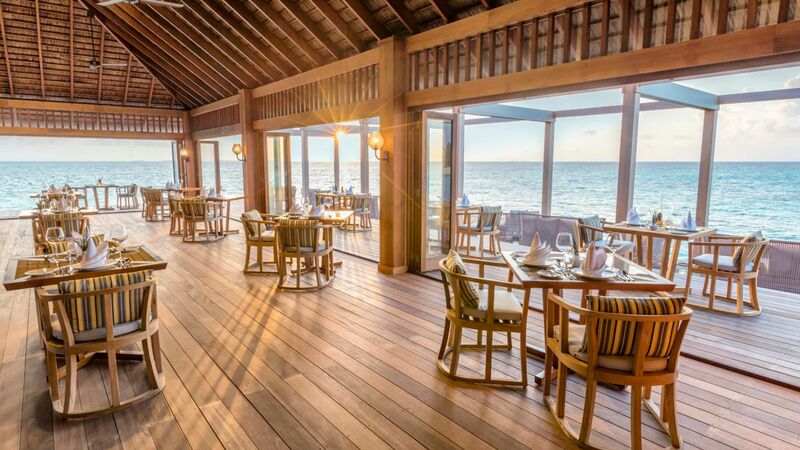 The 5.8 under the sea restaurant often gets the headlines and it was a fantastic experience but the food in all the restaurants was excellent and each offers a wonderful atmosphere. We went for the all inclusive package and I think it is worth going for. There is excellent wine included which is often not the case with all inclusive packages. There were so many wonderful points to highlight from our trip but I would simply urge anyone to visit this beautiful Island and see for themselves. Thank you to all the staff for our dream holiday.